Building bridges that last longer and require less maintenance, thus reducing the traffic congestion and disruption resulting from bridge construction and rehabilitation projects, are the primary goals behind the Federal Highway Administration's (FHWA) Innovative Bridge Research and Construction Program (IBRC). Established in 1998 by the Transportation Equity Act for the 21st Century (TEA-21), the 6-year program provides funding to help State and local transportation agencies use innovative materials for bridge repair, rehabilitation, replacement, and construction. Highway bridges and structures that will withstand natural disasters, including alternative processes for the seismic retrofit of bridges. The program also has the goal of reducing the maintenance and life-cycle costs of bridges, including the costs of new construction and the replacement or rehabilitation of deficient bridges. The deck on this bridge on Maryland Highway 24 is being replaced with an FRP composite deck. Since the program began, 157 bridge projects have been funded. "I don't think there's any doubt we're seeing more interest from States in using innovative materials and technologies," says John Hooks of FHWA. 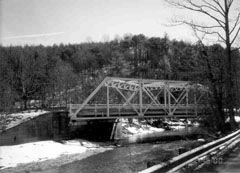 In 2000, the projects included the replacement of girders on a single span bridge in Alabama with fiber-reinforced polymer (FRP) composite girders, the use of high-performance concrete (HPC) for the deck slab and high-performance steel (HPS) for the bridge plate girders of a new bridge in Connecticut, and the incorporation of HPS plate girders into a Georgia bridge. FRP composites are more corrosion-resistant than conventional materials, as well as being more lightweight and easier to handle and install. HPC is engineered to produce mixes that better meet the requirements of specific bridge projects, while HPS is stronger, easier to weld, and more resistant to corrosion than conventional steel. Projects selected for FY 2001 funding include the use of HPS for the girders and steel plate of a bridge in California, the incorporation of FRP into the deck slab of a bridge in Iowa, and the use of HPC to build the deck slab of a Chicago, Illinois, structure. Of the 157 projects funded between 1998 and 2001, 84 used FRP, 30 involved HPC, 24 incorporated alternate rebars such as corrosion-resistant steel and solid stainless steel, 17 used HPS, and 20 incorporated a diverse range of other technologies (note: some projects used more than one material). TEA-21 authorized $108 million for the program, with $6 million of that targeted for research and technology deployment activities. It is expected that $17 million will be available each year for construction projects until the program concludes in 2003. Candidate projects for FY 2002 funding will be solicited beginning in March of this year. The project solicitation will be sent to all State departments of transportation and FHWA division offices and will also be published on the IBRC Web site. While bridges on all public roads are eligible for IBRC funding, applications must be submitted through a State department of transportation. The selected projects will be announced in December 2001. The selection criteria includes looking at whether the project meets one or more of the program goals, incorporates materials or products that are readily available, and is ready or nearly ready to proceed to the construction phase. More information can be found at the IBRC Web site. The site includes an overview of the program, a database of all the projects that have been funded, and opportunities to participate in an online discussion group and sign up for a list serve on new bridge materials applications.